Last week, a switch was thrown, and the Summer Olympics came dimly into view. It was thrown to mark 100 days until the start of the London Games. Depending on your level of interest, the switch turned on a big spotlight or a 60-watt bulb dangling from the ceiling. Not to say the media move in lockstep, but one day there is absolutely no mention of the London Games. The next, a countdown is under way and our attention is supposed to turn—if only a little—to gymnasts, equestrians and a Chinese badminton player. But it hasn’t, of course. And it won’t right away. Not unless Mel Kiper Jr. has the badminton player on his big board. American swimmer Michael Phelps has won 16 Olympic medals—six gold and two bronze at Athens in 2004, and eight gold at Beijing in 2008. Never mind the rest of the world’s Olympians. For the time being, what most of us know about American Olympic hopefuls could be stuffed inside that Subway breakfast sandwich Michael Phelps keeps eating before he jumps in the pool. Except for Phelps, between the prior Summer Games and this one, our Olympians could not have done a better job of disappearing had they enrolled in the Federal Witness Protection Program or taken a seat on Conan O’Brien’s couch. 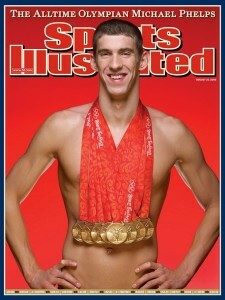 When I think of current American Olympians, I think of Phelps. And of Portsmouth track star LaShawn Merritt, the reigning Olympic champion in the 400 meters, who is coming back from a drug suspension. But then my mind goes blank and I start wondering what kind of sports jacket Bob Costas will be wearing on the NBC set from London. When I try to envision an American who can compete with Jamaica’s Usain Bolt in the 100 meters, my thoughts wander and I remember that Robert Griffin III, the Redskins’ first-round draft pick, was a great college sprinter. The Olympics are on the distant horizon, but the NFL is always with us, right? Griffin’s dreadlocks already are more familiar to every American man, woman and child than any U.S. Olympian other than Phelps. Besides Phelps, the only other gold medalist we see on TV on a regular basis is Bruce Jenner, who won the decathlon in Montreal in 1976, and now plays confused reality-show father to the Kardashian sisters. Will another Phelps or Jenner emerge from the London Games? Probably not. It rarely works that way anymore because the Olympics don’t resonate as they once did. Taking into account all the TV hours and Internet sites devoted to sports, you’d think the best of aspiring Olympic athletes would enjoy greater general appeal. But just the opposite has happened in recent years. As media have expanded, networks and websites are limiting their coverage to the same broad-interest sports—the ones that make them the most money. None are of the Olympic variety. Track and field, once a glamor sport, has lost its footing in America. Drug scandals may have contributed to the loss of popularity, but so has the indifference of the media, especially TV. The NFL and college football, Major League Baseball, the NBA and college basketball, the NHL, NASCAR, golf and tennis—even poker, if we can call it a sport—are TV staples. But attempts at variety pretty much end there. When Olympians and Olympic hopefuls are excluded from the mainstream sports conversation, they get pushed even farther to the fringe, where average Americans find fewer reasons to connect. During the countdown, awareness of the Summer Games will be raised, introductions made. Give America 50 days to focus. On second thought, make that at least 80. The light has been switched on, but, for now, nobody is home. Bob Molinaro is a long-time sports columnist for the Norfolk Virginian-Pilot. He has covered three different Olympic Games as a reporter. The above article is reprinted here with permission. Readers can read this and other recent columns he has written by going to http://hamptonroads.com/category/pilotonline.com/sports/bob-molinaro. You can reach Molinaro at 757-446-23723, bob.molinaro@pilotonline.com, and Twitter@BobMolinaro.